It didn't happen quite as rapidly as it might seem from the time-lapse video above, but as bridge projects go this job in northwestern Arizona was lightning fast. 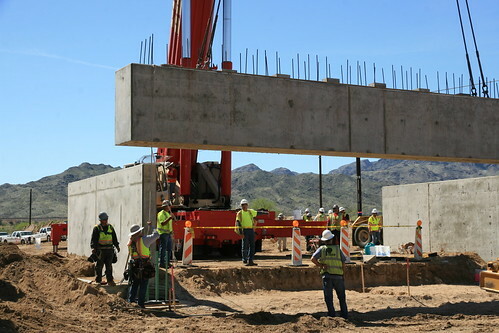 After four days of around-the-clock work, the Arizona Department of Transportation installed Arizona’s first prefabricated bridge along Oatman Highway, also known as old Route 66, with the help of Mohave County and the Federal Highway Administration. This innovative approach, in which the 110-foot bridge was manufactured in Phoenix and then transported in sections to the site in northwestern Arizona, saved a lot of time and cost in detours for local traffic and visitors. In this case, the road was closed for only four days instead of weeks or months. Mohave County also estimated this approach saved $2.6 million in impacts to travelers and businesses, including work zone delays and detours. The bridge lifts Oatman Highway over Sacramento Wash, a mile north of Interstate 40 in Topock, and will help prevent future flooding of the road. Mohave County received a $1 million Federal Highway Administration grant toward the $1.8 million project, which ADOT administered. You can see lots of photos from the project in the slideshow below.